My journey to better health has led me into researching some pretty interesting and sometimes pretty controversial topics. So many of us are led to believe things like avoiding fat, sugar, and salt are the ultimate answers to achieving the skinny waste-line and health you’ve always wanted, but what if I told you that this isn’t true? Sure, avoiding PROCESSED fat and sugar is really important, but HEALTHY salt? I have to disagree. Whether you believe it or not salt is not the villain we make it out to be. Unless you eat table salt. What’s that? You think table salt is fine? Well, I’ll let you in on a little secret – table salt is composed of 97% sodium chloride, is chemically produced, and it’s bleached. It also happens to contain aluminum more often than not which has been linked to Alzheimers disease. Table salt is not in any way natural and is completely devoid of trace minerals. So okay, “avoiding salt” has its place, but only if you’re using table salt. The human body contains many highly concentrated minerals and other nutrients that allow it to function properly WITH the proper levels of salt. Consuming table salt can actually aggravate these ailments and make them worse because it creates mineral imbalance. Eating natural unrefined salt in the proper amounts can help reverse these ailments. Besides tasting great, himalayan salt has the ability to balance and regulate electrical, chemical, and hormonal processes. Which Natural Salt is Best? I’ll admit to owning quite a few varieties of natural salt like Celtic Sea Salt , Maldon Sea Salt , regular sea salt , Velvet Du Guerande , Hawaiian Bamboo Jade Sea Salt ….but I always go back to Himalayan . This type of salt does not come from the ocean, but from high in the Himalayan Mountains and contains all 84 trace minerals our bodies need. Its flavor is much less intense than sea salt so it works well in sole; a natural salt drink that I’m going to teach you how to make! Did you know that our bodily fluids are primarily made of salt? A mother’s amniotic fluid, the blood in our veins, lymphatic and cellular fluid, even the contents of our tears all rely on life giving salt. Without it our neurons cannot communicate clearly (brain fog anyone?) and our adrenals can get run down more easily. Every cell in our body depends on salt’s ability to help our body transport nutrients, balance fluid, and support hundreds of biological pathways. Having the proper amount of natural salt in our bodies ensures speedy cell regeneration and improved metabolism. Without it our bodies become prone to disease and other ailments. 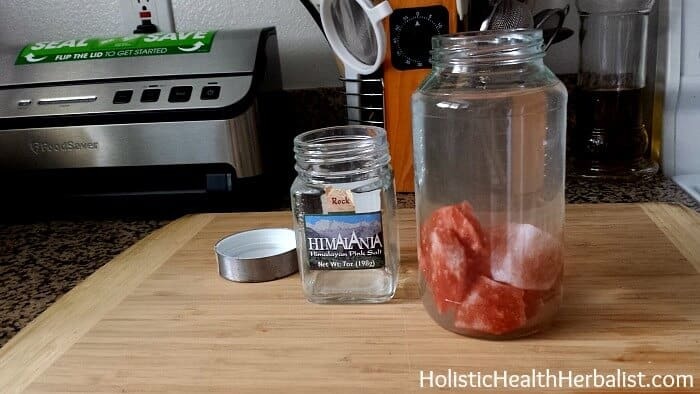 Besides using it in sole, you can use Himalayan salt in a variety of ways. I LOVE that description don’t you? Who wouldn’t want some liquid sunlight in their body? Sole (pronounced solay) is water that has been fully saturated with natural salt. The water has absorbed so much salt that it cannot absorb anymore producing an electrolyte rich brine that can be used as a daily supplement. Properly made sole will always have a layer of salt at the bottom. This means that the sole is at 26% salt solution; the proper ratio for good sole. When the salt is dissolved in water the result is a highly concentrated, electrically charged (think detoxifying) matrix of all 84 trace minerals. This elixir offers balanced nourishment to every cell in your body and assists the kidneys in maintaining fluid balance. Its energetic vibration will last in the body for a full 24 hours. Some people may feel the need to have more solay later in the afternoon in place of their tea or coffee. For years we have been told that salt is harmful to our health but as we’ve learned above, true healthy mineral rich salt has a variety of health supporting benefits. Sole has been used for centuries for these very reasons. Today, making sole is a simple inexpensive addition to any healthy lifestyle. I mean really- it’s cheap and offers boundless health qualities. There’s really no excuse not to make it. 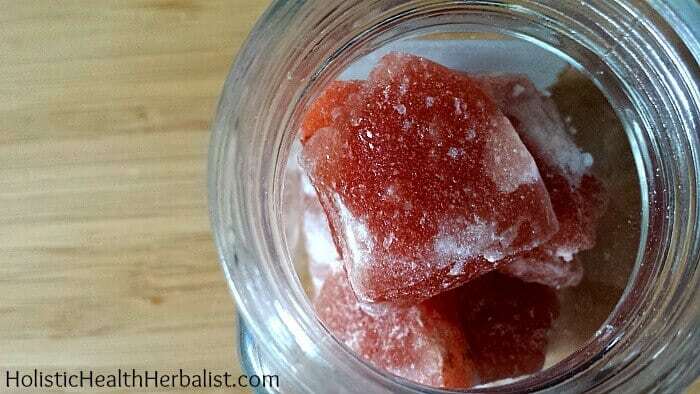 You can use any of these salts and get the same health benefits in your homemade sole. Feel free to experiment! To learn more about these particular salts, please check out this article. 5. Once you’re sure that no more salt can dissolve (there will be a layer of salt at the bottom), take 1 tsp of sole mixed in room temperature water upon rising- that’s all you need! 7. Keep refilling the jar with water and healthy salt as it runs low. [yumprint-recipe id=’7′]Sole will never go bad as long as there is always a layer of salt at the bottom AND you refrain from using metal utensils. Salt is naturally anti-bacterial and anti-fungal in high concentrations- which is exactly what sole is! Why shouldn’t you use metal in sole? “The reason for [not using metal lids/utensils with sole] is that salt when mixed with water can (and will) oxidize metals. It is the same reason that salt on the roads will rust your car. Dry salt can sit on dry metal without it causing a chemical reaction – however when you add water to the equation everything changes and the chemical and physical reactions start to take place. When this happens it can release other metals and chemicals into the salt water as the metal lid (or metal spoon) starts to corrode. Even if they are stainless steel or other non-corrosive metals that won’t rust in theory, they can still react to the salt water. Doesn’t Salting my Food do The Same Thing as Drinking Sole? When natural salt is mixed in water the minerals become ionized which charges them electrically. They also become hydrolyzed which makes the salt very easy for the body to use. The solution literally passes right through cellular membranes to offer nutrients to cells. It is the absolute best way to absorb minerals. Furthermore, mixing natural salt in water changes its structure because the positive ions of the salt surround the negative ions of the water. This happens in an interchangeable cycle. The electrical charge that results allows cells to communicate with one another. Simply eating natural salt does not create quite the same effect. Of course, you will still benefit from eating natural salt itself but taking it as sole really allows the body to use it to its full potential. Can You Just Add a Spoonful Salt to Water and Get The Same Result? A tsp of sole mixed in water is 478mg of sodium while mixing 1 tsp of natural salt in water is 2,292mg of sodium. The resulting ratio is WAY out of balance and you will not get the same health benefits at all. In fact, I wouldn’t call taking a whole tsp of natural salt at once healthy in any circumstance. And besides, I doubt you could comfortably drink that much salt in 8oz of water comfortably anyways. Sole is the perfect ratio of salt and tastes just right. Not too salty at least in my opinion. Some people may still have trouble when they first begin drinking sole. Adding a small squeeze of lemon or a small amount of raw honey usually fixes the issue but I’m not sure if this affects the result. Healthy Salt? What are The Health Benefits of Salt? Herb Salt is Easy to Make! Will it be less effective if it is added to ice water instead of room temperature water? I gag on beverages that aren’t ice cold. Can it be stored in a plastic bottle if it is BPA free? My son has an extremely rare genetic syndrome. One of his many symptons is a slow swallow that can result in silent asperation, thus all of his liquids need to be thickened with a product called simply thick. Can sole water work if mixed with the simply thick? I am also not sure if he will drink it if it is not flavored. I would think sole would work with Simply Thick. You may need to try it to see if it works. However, the flavor will be extremely salty if you thicken just the sole itself. You would definitely need to dilute it. If he doesn’t like the flavor, it could be a sign that his body is not craving the salt at that time. Sometimes it will taste good to me and sometimes it won’t. I hope it works out for you! You may also be able to add the sole to savory things that he likes like soups you have thickens for him. I am on a 24 hr feeding tube due to an illness (gastroparesis), and do water flushes every four hours. I can tell that my electrolytes are off and was going to add coconut water to my flushes, then remembered sole. You had mentioned not to eat or drink anything for a certain amount of time before and after consuming. Because I’m on a 24 hr feed, this is impossible for me. Would it still be effective? Great info, by the way! I think your body can still use the minerals and electrolytes 🙂 Start small and see how it goes! So did I Rachel, so did I. Love this post. I naturally need to get more salt into my daily diet due to adrenal fatigue. This would be a great way to do that while reaping other benefits as well. Definitely pinning this and making this from now on! P.s. I email my mom about this as well regarding the table salt and Alzheimers. She is afraid of being afflicted by that like her father was. Hopefully she’ll make the switch. This is why I’m trying it. Adrenal fatigue. I love sole! I never thought to add it to my bathwater! Great suggestions. I love himalayan salt. Wonderful post! Pinning and sharing – just perfect! I made this for the first time last month. It’s so easy to use and makes a big difference! For years our family has been adding sea salt to water when we drink it, along with all the other foods we add it to including our fermented beverages such as beet kvass and bone broth. It’s a great way to get more minerals and support adrenals! Thank you for this post! Excellent post! I love my himalayan salt and now I’m off to make some sole! Thanks for sharing Tash! I have really been wanting to try this. Pinning so I remember to make a jar. Thanks.